It's been a while, it really has. 5 more days than a year, to be exact. But fear not, my mustardy allies, for although I have not been writing mustard reviews for more than 12 months, I have most certainly been delighting my taste buds with that succulent mix of mustard seed and vinegar that we all know and love. I promise to you all, this will be only the first in a new string of mustard reviews that will seek to improve upon the platform I built a year ago. And with that, I bring you the king of the mustards I have tried in 2015, a true tour de force coming at you from the Rhineland: the Alstertor Düsseldorf-Style Mustard! An adorable mug o' mustard! 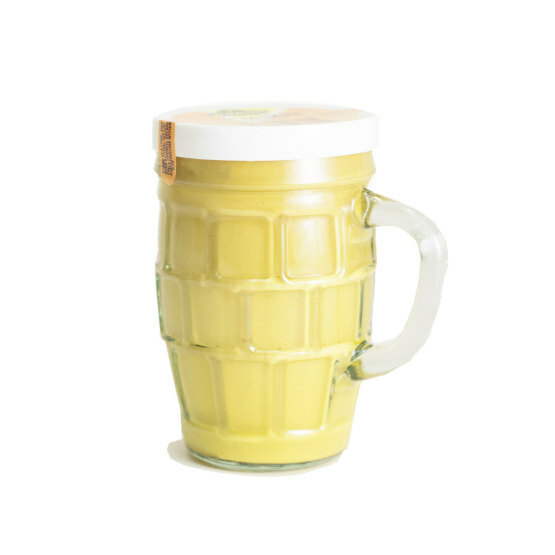 As per tradition here on Hard Yellow, I shall first address the vessel for the mustard; in this case, it is a lovely glassware in the shape of a classic German beer mug, tenderly made in what I can presume is only the most noble of German factories. While you, dear reader, may guffaw at the premise of a handled mustard jar, I rebute thee - having a handle only allows for increased precision when you come down to scraping the last knifeloads of mustardy goodness out of the jar. And after all, it doubles as a glass afterwards! But let me be clear, although the choice of container is fabulous, this is by no means the best part of the this mustard. This mustard, in what I can only assume is what other Düsseldorf-style mustard strive to be, is audaciously smooth, even to the point of being 'creamy'. I was awed by the unique consistency of this fine specimen, which was also surprisingly light. The taste itself was a milder yellow mustard, definitely not as vinegary as a traditional American yellow; the mustard flavor was allowed to shine through, which I always appreciate. The fact that it's on the milder side does mean it's not the best choice on a sandwich, where you need a strong mustard like Colman's English to punch through the bread and meats - this mustard is best for dipping meats like pork or comping with potatoes or pretzels, situations where it does not overpower, but complements the food. In this way, this mustard is very refined, above the usual proletarian yellow mustards; this is a high-class fellow, deserving to be used in your finest meals. For my first mustard rating of 2016, I give this fantastic mustard a 9 out of 10, up there with other stellar mustards like the Colman's English and Olivier Cognac mustards. This is a culinary delicacy that one cannot afford to miss. And to you, I bid you a happy February of mustardy splendor! And a February of mustardy splendor to you too good sir! Commentin', are ya? Very good. Get to it. You, our loyal mustardeer, can expect reviews once a week [read: whenever I get around to it] on the most hippin' an' happenin' mustards! Use the HY RSS Feed! Hard Yellow. Simple theme. Powered by Blogger.